Ties: I’m not sure a tie is classified as an accessory, but you should wear them anyways. This week’s additions come in gray, brown & party. This might seem like a bit of a cop-out, but sartorially, you will learn heaps more about style from JFK than I could ever teach. Brilliant. So these don’t come as quickly as I’d like but I haven’t lost interest in getting them out from time to time. This week’s AFT is powered by Urban Outfitters. I’ve never actually purchased anything from one but could see myself spending a few dollars there if I happened to stumble into a store. These three pieces would work well for a number of occasions. You can wear them to work and not have to think twice about heading straight to dinner from there. 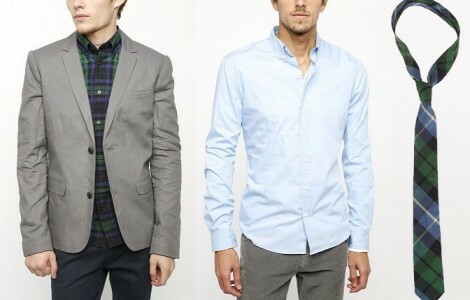 Could be paired with slacks like you see with the jacket or jeans as well. You’ll regret the purchase if you buy the hideous plaid shirt currently under the jacket. And we’re back. I enjoy Fashionable Thursdays, just been lazy about getting back into them. It’s actually kind of surprising how much traffic they get from searches. This week is pretty tame, nothing too crazy although nothing actually falls below the $175 mark. Might have to do a blue-light special for AFTv8.